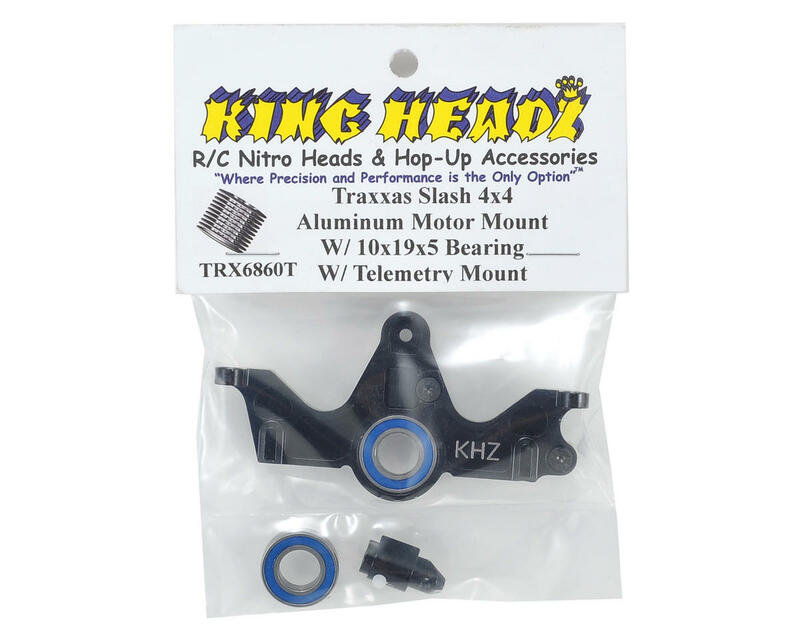 This is an optional King Headz Traxxas Aluminum Motor Mount with Telemetry Mount, and is intended for use with the Traxxas Slash 4x4. This motor mount has been CNC machined from 7075 grade aluminum and anodized black. This upgrade part is a direct replacement for the stock motor mount, has been designed to work directly with either the slipper or center differential and includes the provisions for the telemetry RPM sensor mount. 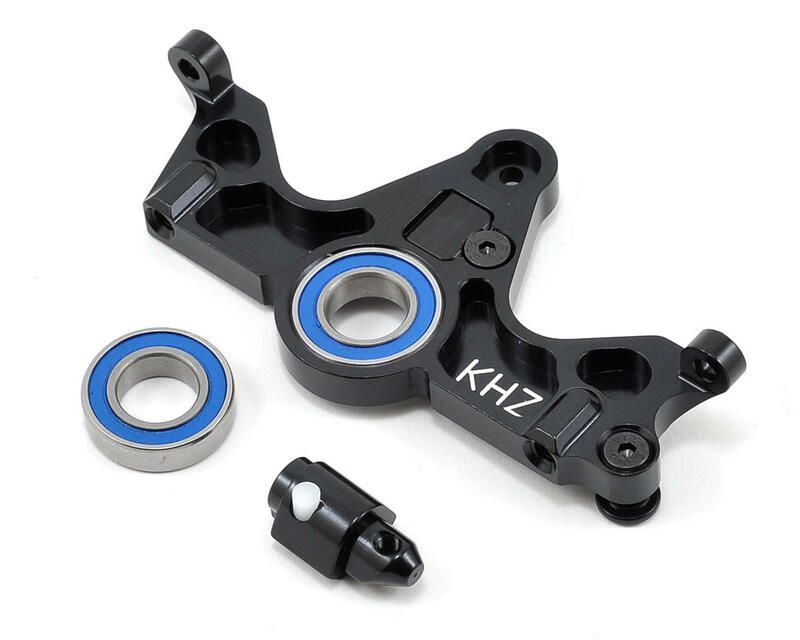 Additionally, the mount uses a 10x19x5mm bearing which is much stronger then the stock 10x15x4 bearing for increased durability and bearing life. WOW! What a drastic improvement over stock. Comes with 2 bearings. Nice to have a spare around just in case. This mount stiffens up the chassis, and works VERY well. They way that you thread in the motor mount screw no longer requires the lock nut to drop in the top. Oh how many times I have lost that nut. They use a Nylon plug that works to lock in the motor mount screw. Very nice design. I would buy it again in a heartbeat. Stop thinking about it and buy it already. Kingheadz is the way to go. Enough said. A much needed upgrade from stock, and it has been fitted with an oversize bearing as well as coming with an extra one. I used this in my Slash for almost two years, and never needed to use the extra bearing. It eliminated all the problems associated with the original mount and not taking the heat and stress. Quality made product, as are all of their other products, where some other manufacturers tolerances aren't quite as good. Must have addition for the Slash 4x4. Don't think about it, just get it. Everything the other reviews say is true. Very impressed with the construction and design of the aluminum mount and the bearing itself is huge. I bought this as part of a big upgrade my Stampede 4x4 that included a lot of drivetrain bits to support a RX8 with Pro4 HD 4300. Installation was SUPER easy and the bearing seems to be holding up just fine with the increased power. I also really appreciate King Headz including a spare bearing, though I suspect it won't be used for quite some time. Overall, 2 thumbs way up.